Soy dishes are food with high protein content which can substitute for animal products. Chinese chefs have devised recipes that turns soy beans into butter, sour cream, cheese and even meat. 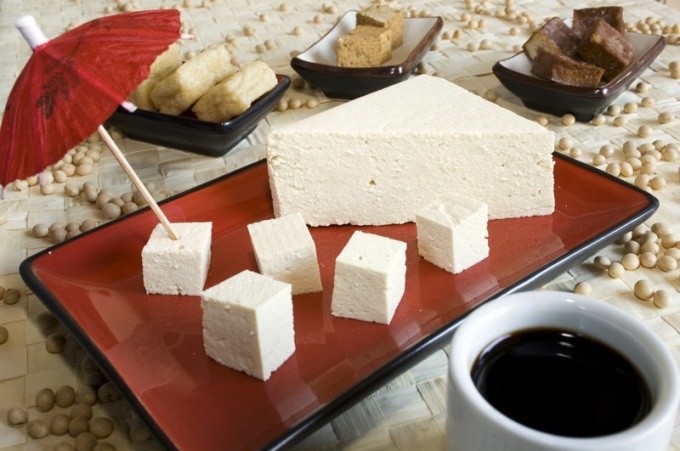 From soy beans can be cooked a lot of healthy options, but first you must learn how to make your own at home soy milk and tofu is the basis of many Chinese dishes from soy. - water for making milk – 8 cups. This recipe is for 1 liter of finished soy milk. If you need more or fewer, take away or increase the ingredients in the appropriate proportions. Soy beans, rinse and soak in water for 10-12 hours (this rule is mandatory for all recipes). Then drain the water, rinse the beans, put them in a saucepan with fresh water. Put the saucepan on the fire, bring to a boil and immediately remove from heat. The water will drain through a strainer into a clean bowl. Boiled soybean crush in a blender or skip through Mincer with a fine grid (it is better to repeat this procedure 2-3 times). If you're using a blender, then ground soy gradually add the previously separated water, yet does not connect all. If you missed the soybeans through a meat grinder, then add water to the resulting puree gradually while stirring. Then press the mass through cheesecloth. For this pitch double layer gauze towel, place it in a pan or bowl, pour into it liquid soy mash, tie corners of cloth and hang it on a hook above the pan (it will drain the finished soy milk). Soy milk you can store in the fridge, like regular cow's milk, but before doing this be sure to sterilize it and let cool at room temperature. - lemon – 1 PC. Squeeze the juice of one lemon, pour it in a pan with soy milk and close the lid. Wait 15-20 minutes for the milk storageas (curled). In the meantime, take a colander and cover with gauze, folded in half. Then with a slotted spoon, remove from the pan soy flakes and place them in a colander. Cover the top ends Marley, put the weight and leave for an hour and a half. After the allotted time remove the goods, being careful not to break, remove the cheese with the cheesecloth from the colander and place in a bowl filled with fresh, cold (preferably icy) water. After an hour tofu will be ready. Can store it in a container of cold water in the refrigerator for weeks. - vanilla, cinnamon to taste. Cooking pasta is very simple. Chop the nuts in a mortar. In a blender, mix tofu, chopped nuts, sour cream, sugar and spices. Make pasta sandwiches and serve tea. If everything is not immediately used, place in a glass jar and store in the refrigerator no more than 3 days. - soy sauce – 1 tbsp..
Proustite soybeans. To do this, rinse them and soak for 6-8 hours. Then put in a container with a hole in the bottom (you can use a new flower pot or colander) and close with a clean cloth so they do not get direct light. Water the beans with lukewarm water in summer 3 times, and in the winter, 2 times a day. If the container is put in a warm place (near the battery, furnace, stove), they will germinate faster. At room temperature soybean germinates in about 2 weeks in the cold season, for 4-5 days in the warm. Ready to eat are sprouts, have attained a length of 5 cm For the salad take only sprouts, the beans themselves are in the food is not suitable. Slice the onion into rings, fry in vegetable oil until Golden brown and let cool. Then attach to the onions beansprouts, garlic, passed through the frog, sesame seeds and mix. Pour all the soy sauce, serve it as a healthy cold snack. If you want soy sauce to cook yourself, keep in mind that to make it at home quite difficult because you'll need a koji (starter), which you will hardly find in Russian stores. Yes, and the process of fermentation, fermentation and further production of the sauce in the Chinese tradition, is very long. There is a version of soy sauce "in Russian." Take 100 grams of soy beans, 2 tbsp rice broth, 1 tbsp flour and 2 tbsp butter. Soy soak, boil until tender and chop in a blender. Add broth, butter, flour and a pinch of salt. Stir, put on medium heat and while stirring bring to a boil. The Russian equivalent of soy sauce is ready, you can pour them a salad.